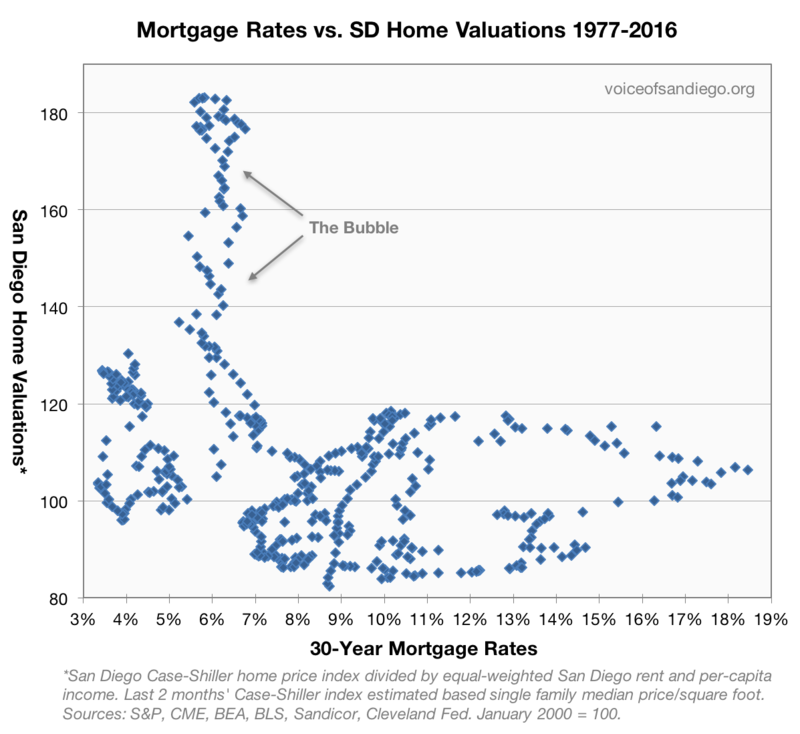 How expensive is San Diego housing? How do low interest rates impact home prices? Does it make sense to buy a home right now? We’ll give some quick thoughts on each of these below. Short answer: it is unusually expensive, but not nearly as bad as during the bubble. The best way to determine home expensiveness is to compare home prices with local rents and incomes, which between them encompass most of the factors that should be expected to drive home prices long term. Measuring home prices against their economic fundamentals tells us the valuation of homes, which is a lot more meaningful than home prices on their own. 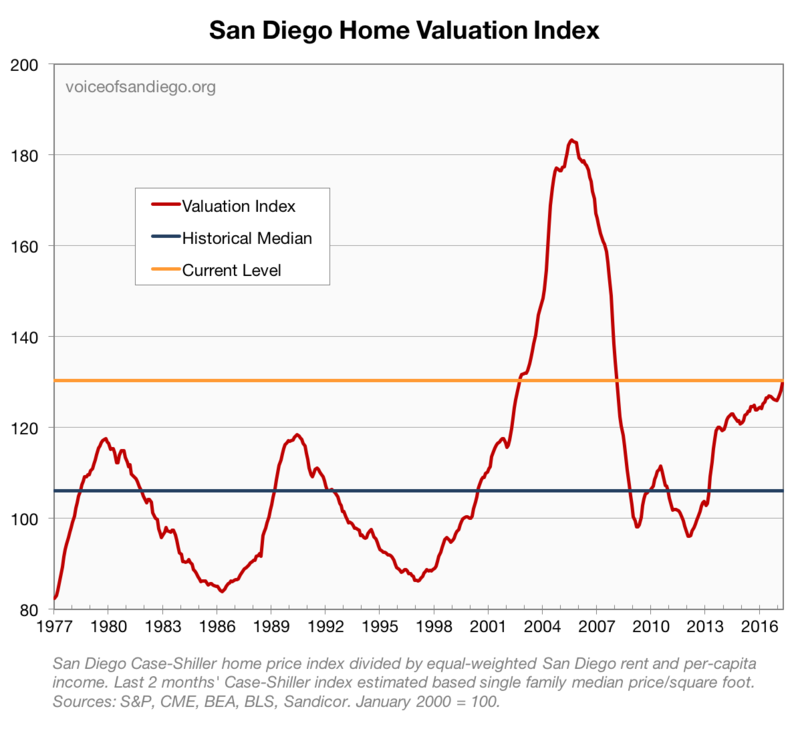 San Diego housing valuations have had some wild swings over the years. But, whenever they’ve gotten out of whack in the past, they’ve eventually come back to normal (as loosely measured here by the median historical valuation). The housing bubble was nuts – at the peak, valuations reached 73% above their historical median. 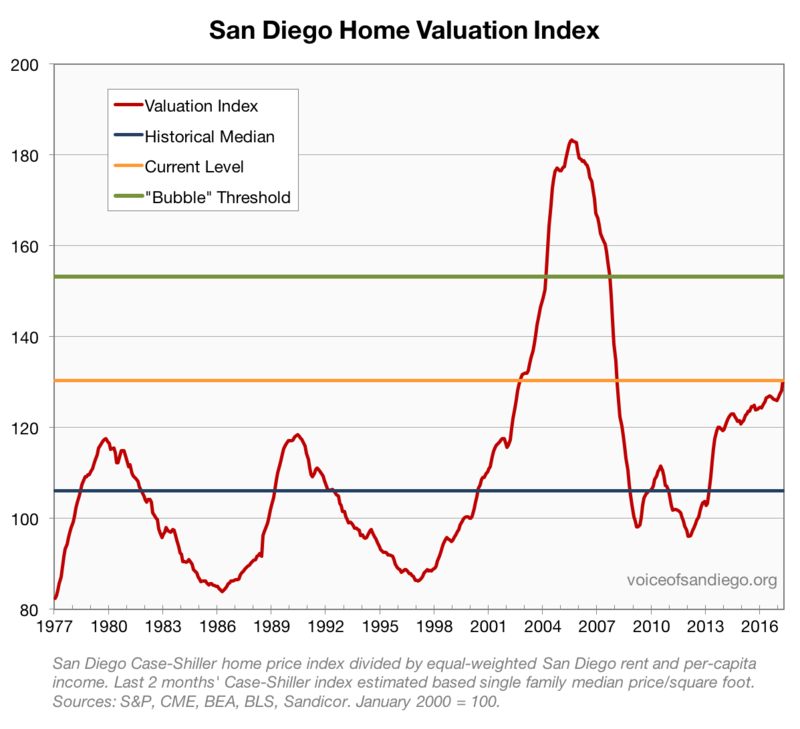 The new nominal high in home prices has caused some worry about a bubble, but current home valuations are substantially lower than they were at the bubble peak. That said, valuations are the highest they’ve ever been outside the bubble period! Will valuations eventually return to “normal” as they have in the past? That’s usually a good bet, but in a small and supply-constrained market like the local housing market we have to acknowledge the possibility that values could stay higher indefinitely (especially given low interest rates; see next section). And declining valuations don’t necessarily assure declining prices: valuations could return to normal if prices just flattened out for several years while incomes caught up. Still, homes aren’t just expensive – they are unusually expensive, even for San Diego. And up until now, high valuations have always made their way back to normal eventually. There’s a pretty good chance that this pattern will repeat yet again, and if it does, that could lead to years of home price stagnation or outright declines. It’s definitely a risk worth considering. There are several reasons this might be, including the influence of other economic factors (many of which push home prices in the opposite direction as rates), the impact of inflation expectations, and the fact that rates can be expected to change a lot over time. Low rates are definitely helping to ease the burden of high home prices for now, and it’s possible that if rates stay this low, they will help homes stay expensive. But rates may not stay this low. And even if they do, as the second graph shows, it’s not a sure thing that they will keep home prices as high as they are now. Short answer: no, we don’t think so. Investor sentiment is unfortunately harder to graph, but anecdotally, it’s clearly quite different than in the mid-2000s. There is optimism, but very little of the euphoria and blatant risk-taking that was on display during the bubble. 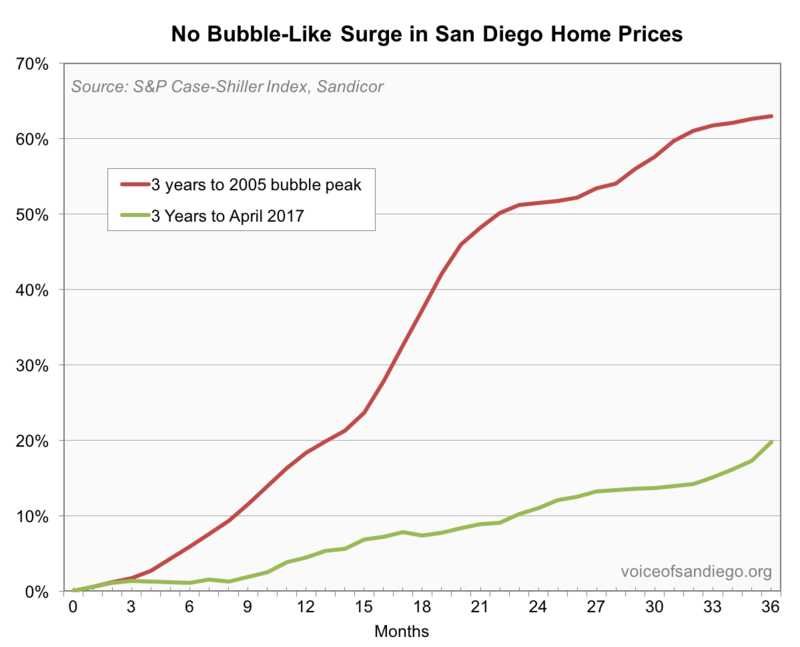 In short, while it’s expensive, San Diego doesn’t seem to exhibit either the valuation or psychological characteristics of a true bubble. This is important because bubbles almost always end very badly, whereas “merely expensive” markets have a much better shot at a soft landing. Given that home valuations are quite high, but monthly payments are low, this is a nuanced question. The answer comes down to which of those factors you care more about. 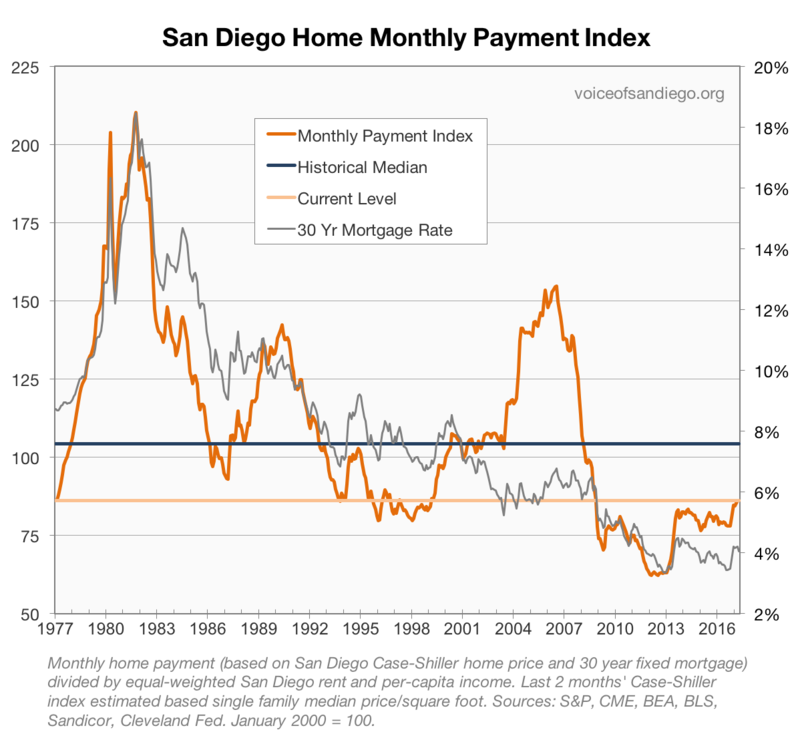 If you are buying a house that you intend to hang onto indefinitely (or at least for a good long time), and you are financing most of the purchase with a mortgage, you should probably be more concerned about monthly payments than future home price changes. Given reasonable monthly payments right now, for someone in this situation it may make good sense to buy. On the other hand, if you have a shorter time horizon – for example, if you are in the area only temporarily, or you hope to buy a place and move up in several years – buying looks a whole lot less compelling. Valuations at these high levels suggest unusually low potential gains, and an unusually high chance of price declines. Selling at a loss could more than offset the benefits of low monthly payments in these situations. Potential shorter-term buyers should proceed with caution. The silver lining to this squishy answer is that in most cases, it’s reasonable to take either course. San Diego housing seems unlikely either to run away without you, or to crash horribly. So the decision can be more based on your own personal situation, preferences, and whether you find a house you really like. That’s actually a good thing.